The end of the year always seems to bring about my need to finish projects and update all my lists so that I can get a fresh start in the New Year. It is silly in some respects, I suppose. The year's end and beginning are more symbolic than anything. The fiscal year for my agency begins and ends in July. I was born in September, so technically, shouldn't my year begin and end then? And yet, I find myself eagerly anticipating the end of one year and the start of another as per the Gregorian calendar. It's so much more fun when we celebrate together, don't you think? More meaningful somehow. Two thousand nine has been a challenging year, and I wish I could say I was looking forward to two thousand ten, but, well, let's not go there. Positive thoughts. On the reading front, at least, I predict good things for us all: many top notch books, interesting discussions, the strengthening of friendships and connections, and, of course, the making of new friends. I am ever so grateful to all of you who visit my blog and read my ramblings. I truly value the friendships I have made in the blogging community. This past year was a bumpy one reading wise. My reading numbers are considerably lower than they have been in years. No, I wasn't watching more television. And regardless of what my husband says, it isn't Big Money's fault either. Things came up. Life happened. Reading took a backseat at times. Despite that, I read quite a few really good books. While last year, not one book I read had that "wow" factor, this year four did and nine came awfully close. Personally, I think that's pretty darn good. This year I committed to read for a literacy based charity organization. Jodie declared it The Year of Readers. 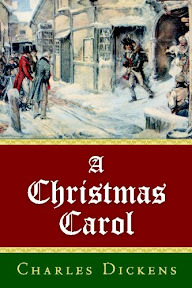 Many readers joined in the effort. I committed to donating $1 for every book I read and the same for every challenge completed. I obviously had hoped to have a better year when I signed up for this event. I stated up front that I was not going to be actively seeking out sponsorship--it's not something I am comfortable with, and so my donation will probably seem very small compared to what others are able to contribute. Still, every little bit helps! I made the (unspoken) decision when I signed up for the project that I would donate at minimum a $100 to the Book Wish Foundation, regardless of how much I fell short. And that's exactly what I plan to do. I wish I could do more, but right now, unfortunately, that just isn't possible. Before I get to my list of favorite books read this year, I thought I would begin with a few other fun facts. As I mentioned earlier, I read a lot of good books this year. I was introduced to many new authors via their books and re-visited authors I've enjoyed before. It is never easy coming up with a top ten list. At least not for me. Because I rate the books I read, it's a little easier, I suppose, but it doesn't take the pressure off completely. I still have to put them in some semblance of order--and that's the hardest part of all. 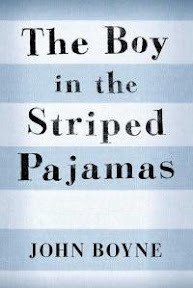 Each of the ten books that made the final cut are books that touched me in some way. The writing is beautiful and the characters are the kind that get under my skin and find their way into my heart. These books are the reason I read. If you want to know more about any of the books that made my list and the specific reasons I love them so, please check out my reviews. There will be no reading goals or resolutions this year. At least none that are set in stone or written down. Well, except for the two reading challenges I have already committed to. I have an idea of the many directions I want to go, but only time will tell which of those directions I will be traveling. 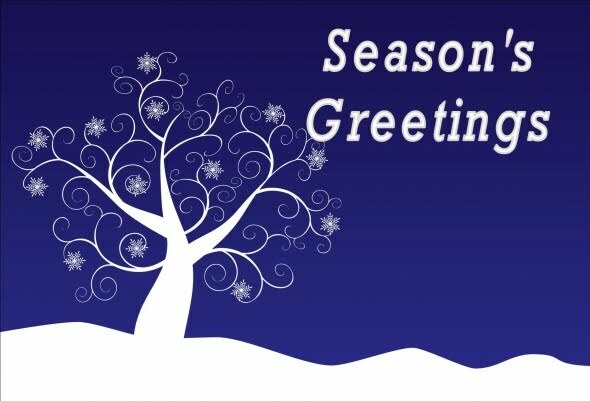 I hope you will join me for another year of reading and sharing bookish thoughts. Have a Safe and Happy New Year and Happy Reading! Whew! I made it with just a few days left in the year to spare. For a second there I was afraid I might not make it. My final challenge of the year was the War Through the Generations: WWII Challenge hosted by Anna and Serena. I committed to reading 5 books for the challenge. My original list included four of the listed books. That's not bad considering how poorly I stuck to lists this year. The number of World War II related books out there is astronomical. I could probably devote an entire year to reading the books I own but have yet to read on the topic. Of all the wars, it is the one I seem to be the most drawn to. I liked all of the books I read for this challenge, some more than others. My only regret is that I didn't read more of a variety. 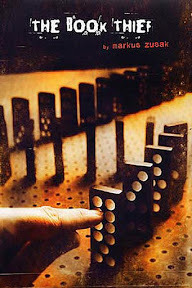 My stand out favorite was The Book Thief which I nearly didn't read, except for the prompting of several fellow readers. Thank you to Serena and Anny for hosting the War Through the Generations: WWII Challenge this year! I enjoyed each of the books I read for this challenge and would gladly read more by any of the authors. Many thanks to Annie for hosting the What's in a Name Challenge! All together, I signed up for 16 challenges this year. Of those 15, I completed 7 with one continuing on into the next year. Alas, it was not a year for reading challenges. One put a .45 pistol to his head and pulled the trigger. Belk heard the hammer snap and at that point didn't care. He begged them to remove the handcuffs. His hands had turned a faint blue and the pain was intense. From the back of the book: On November 4, 1979, a group of radical Islamic students stormed the U.S. embassy in Tehran. Inspired by the Ayatollah Khomeini, they hoped to stage a three-day sit-in protest of the American decision to allow the exiled shah to enter the United States for medical treatment. But these modest peaceful aims were overwhelmed by something much more sinister. The students took sixty-six Americans hostage, kept the majority of them for 444 days in a conflict that riveted and changed the world. Mark Bowden tells the sweeping story of this watershed moment in American history, America's first showdown with Islamic fundamentalism, through the eyes of those who lived it, on both sides of the crisis. I was six years old when Iranian students raided the U.S. Embassy in Tehran. Sixty-six hostages were taken in all. The planned three day protest turned into a 444 day nightmare. I cast my very first vote (albeit unofficial) for President Jimmy Carter that following year. I vaguely remember he wasn't the popular choice, but even then I had a tendency to want to fight for the underdog. I was completely oblivious to the events that surrounded his final year in office and what would be the last straw in what turned the majority of Americans against him at the polls. The Iran Hostage Crisis became a pivotal moment in world history, especially for the United States. Americans would take to the streets in outrage while Iranians rallied in support of their fellow countrymen for taking on "the Great Satan". Iranians had good cause to be furious with the American government who had blatantly interfered with the leadership in Iran years before, knocking aside the Iranian people's favored leader for one the Americans felt served the U.S. interests better. The American favored shah was an oppressive and cruel leader. The tyrant was eventually overthrown and forced out of the country, leaving Iran in the middle of a revolution, different factions vying for power. When the shah was admitted into the U.S. for medical treatment, it was as if the Americans were flipping the Iranians the bird. One particular group, a group of students calling themselves Muslim Students Following the Iman's Line wanted to make a statement and plotted to take over the U.S. embassy in Tehran. The sixty-six Americans hostages were all accused of being spies. In reality, only three of the hostages were CIA agents and none of them had viable contacts within Iran, and therefore, had not really been doing any spying at all. The turmoil in the country made that next to impossible. None of the evidence uncovered during the search of the embassy and the hostages living quarters supported the students assertions that the Americans wanted to assassinate the Ayatollah or do anything other than routine foreign embassy staff weren't also doing, and yet they persisted in their beliefs and acted accordingly. Each of the hostages responded to captivity in their own ways; some were cooperative and tried to make friends with their captors, faith grew stronger for a couple, while others became rebellious and did what they could to torment their captors in their limited capacity. There were escape attempts and attempted suicides. It was a very difficult time for the hostages. Fourteen would be let go before the 444 days were up, leaving 52. Despite denials by the student captors of torture and that the hostages were treated well, that was not always the case. The hostages discovered that many of their captors were uneducated in terms of world events and were zealots to their cause. The American government's decision to allow the shah into the U.S. had been the catalyst that sparked the takeover, but it fed flames that had already been simmering under the surface. The challenges the U.S. government faced in dealing with the situation seemed nearly insurmountable. The demands of Ayatollah Khomeini and the students were not ones the American government wanted to meet, and yet Carter and his administration were willing to make some concessions, even against their better judgment if it meant to return of the hostages. However, the leadership in Iran was unstable and the figureheads the U.S. government were trying to work with on a diplomatic level held no real power. Going in with force would most likely result in the death of the hostages, something the Carter administration wanted to avoid. A rescue attempt was a long shot and a last resort. If anyone could do it, it would be the newly formed Delta Force, a unit of specially trained men, the best of the best. They trained for months, looking at all possibilities. Getting into and out of Iran, and most especially the land locked Tehran, would be one of the biggest hurdles. Those assigned to the mission knew that there would likely be causalities. 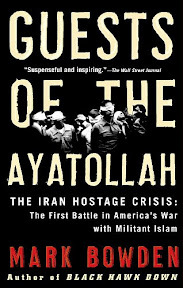 Mark Bowden set out to put the stories of both the captors and the hostages together for the book, Guests of the Ayatollah, as well as those in the military and government. Readers are also offered a glimpse at the reactions and thoughts of the families of the hostages. The author does an amazing job of piecing the crisis together and does so in a way that makes it accessible to the reader. Even knowing how the situation played out, I was still caught in the suspense of the moment as I read. Keeping the hostages straight was a bit of a challenge at first, but I eventually had a clear picture of who those featured in the book were. I selected Guests of the Ayatollah as my pick for the 50 Books for Our Times Project not just because I had a copy sitting in my TBR collection, but also because of its relevance today. Today's Iran is under the control of some of the very people who were involved with the Iran Hostage Crisis thirty years ago. When the U.S. embassy in Tehran was overtaken by those Islamic students, it put events in motion that would solidify the fundamentalists' position in power. It gave Ayatollah Khomeini and his followers the ammunition they needed to step in and take the reins. Not all the students were happy with the result. They went into the situation full of dreams of an Islamic utopia; strike down America and gain their freedom from Western oppression. They hadn't anticipated that their actions would unleash something much darker than they ever imagined. Not everyone feels that way, however. Some still believe in the current government of Iran and find comfort in the strict religious laws and controls. The crisis in Tehran was not just limited to Iran. The cry of the people, the anger towards America, was felt by many in the Middle East. American foreign policy had not always been on the up and up and had offended many. This was the first time America faced off with militant Islam, especially in such a public setting. It was also one of the first times that television played a vital role shaping a major historical event. Western influence is but a part of what the growing fundamentalist Islamic movement is fighting against, however. It is steeped in ideology and tradition, fighting against the inevitable change that comes with the passing of time and a world that is becoming more interconnected and dependent on each other. For its part, the U.S. got a wake-up call from the experience. Despite past transgressions by the American government, the taking of the U.S. embassy in Tehran and the holding and treatment of the hostages was against the law and unethical. It was wrong, and it would come to have a negative impact on Iran in the long run. While the students and Iran celebrated a victory at the time and still try to portray it as such, more was lost than won by everyone during that crisis. The effects still reverberate today. Earlier this year saw uprisings and protests in and outside of Iran which have not been seen in a long time. There are many people who are tired of the autocratic rule of the current ruler, Ali Khamenei, fed up with the oppression and direction their country has gone. Khamenei, just as his predecessors, uses his power to silence those who speak out against him. It is still too early to tell if the current outrage will be a catalyst for change or if, like previous attempts, it will be stamped out by those currently in power. Guests of the Ayatollah deals with an event in history that is a defining moment for not only the United States, but also for Iran and the rest of the Middle East. Its impact is still being felt today. So, to answer My Friend Amy's question, yes, this is a book of our time. The book is over 700 pages long and covers a lot of ground, including going into detail about the Americans' captivity. Sometimes big books like this could do with a little extra editing, but I never felt that way with this one. I have kept my review of this book relatively short and spoiler free, leaving out many great discussion points. I highly recommend it to those who enjoy reading nonfiction and who want to understand and stay on top of current events. Source: I bought this book at a Borders store in May of 2007. I purposefully waited for the paperback version to be released so I wouldn't have to tote the ginormous hardback around. I am pretty sure Christmas came on a Tuesday this year. Tuesday, December 15th. It was the day of my team lunch at work and our Secret Santa exchange. It's my favorite meeting of the year. And not because my Secret Santa made me homemade brownies and filled my gift bag with tootsie rolls. Rather, it's the only real opportunity my team has to get away, just us, and set the shop talk aside. I am blessed to work with such a great group of people. Sure, we get on each others' nerves sometimes, but at the end of the day, we wouldn't have it any other way. Full of the holiday spirit after a fun afternoon, I decided to swing by my mailbox on my way home. I had three packages waiting for me. Well, two were for me. One was for my husband. 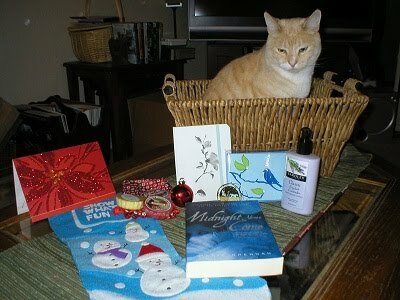 In the corner of one of the boxes was a note saying it was for the Book Blogger Holiday Swap. I also noticed that according to the sticker, it had arrived the week before (but I won't let the fact that I was at my mailbox last Friday evening and was told I didn't have anything ruin my day--I'm in too good of a mood for that). The other two packages were from Amazon and I just knew they were from the SantaThing exchange (hosted by LibraryThing). I signed up my husband this year too, not wanting to leave him out of the fun of receiving a book in the mail. He hadn't a clue so was much surprised when he got home from work that evening. Try as I might, I couldn't wait until my husband came home to open my Book Blogger Holiday Swap gift. 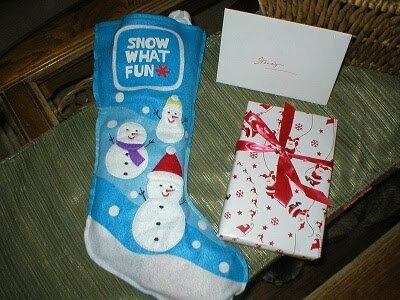 Such wonderful presents awaited me! The snowman stocking was overflowing with goodies and then there was a rectangular shaped package that looked and felt an awful lot like a book. My Secret Santa this year was Pooch from Yarn-Knit-Read-Lit and did she ever spoil me! She gave me heavenly smelling candles in a beautiful cloth bag, lavender lotion, note cards, a journal, a Christmas magnet, and an ornament for the tree. And then there was a book, Midnight Never Comes by Marie Brennan. I let out a squeal of joy at the sight of it! It's been on my wish list for awhile now. I cannot thank Pooch enough for her thoughtfulness (thank you, Pooch!). Everything is perfect. Parker insisted on getting in the photo. If you look closely in both the above pictures, you can see Anya under the glass of the coffee table. As hard as it was for me, I did wait for my husband, Anjin, before opening my SantaThing package so we could open ours at the same time. My husband's Santa, Clue, sent him a copy of Crime Novels: American Noir of the 1930s & 40s. It's the perfect gift for him. He loves noir and enjoys reading short stories. 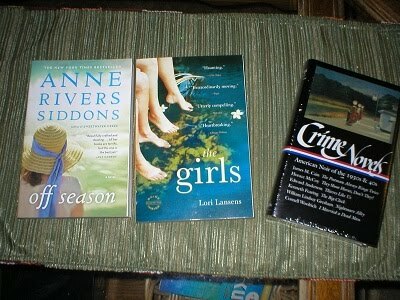 My Santa, Boblinfortino, sent me copies of Anne Rivers Siddons' Off Season and The Girls by Lori Lansens. Both are new-to-me authors, and I look forward to giving them a try. Many thanks to both Clue and Boblinfortino for the books! It was a good day, that Tuesday, the 15th.